Duck hunting reservations refers to our managed wetlands inclusive of our blinds, wade-in, layout boat, pot hole and pond unguided duck hunting. Duck hunting reservations are different than that for field set goose hunts. See goose hunting reservations. When a telephone reservation is made it is to a numbered blind, wade-in or layout, pond or field and that is the extent of the reservation. The hunter then uses his maps and travels to that spot. sets his decoys and hunts. Reservations are for two days at a time with the third day reservation accepted after the first is consumed. While some may interpret this as restrictive it is a matter of building in a choice of where to hunt as after experiencing the wetlands many start to enjoy the fact of not having to look at the same water day to day. This limit also insure those that make reservations are more likely to actually follow through with them. No one is ever denied the chance to duck hunt. 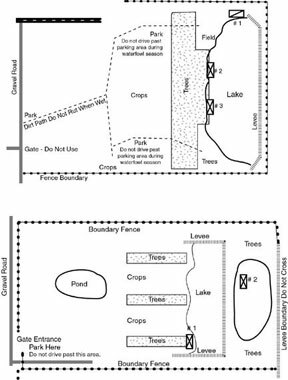 The telephone reservations insure blinds, ponds, holes, wade-in/layout areas are not over booked and is the means for the hunter to know where and when he has a hunt. The best occurrence will be that the hunter will get his first choice of where and when he wants to hunt and no other Association hunter will be there. The worst occurrence is that many duck hunter favor a particular wetlands or blinds and seek to hunt from those more than others. By bad luck and it will eventually happen to everyone that another Association hunter will be faster to the reservation for that blind or wetlands. Sharing of blinds will be required under two conditions. 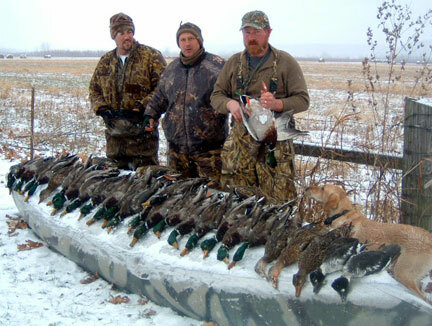 The first condition when Association hunters will share a blind with another is the opening weekend of the north, or first to open waterfowl zone in Missouri. This is a reflection that the bulk of the blinds and wetlands are in Missouri’s middle zone combined with those that like to hunt opening weekend waterfowl that is before the opening of upland bird season. Once, if, all blinds in the north zone have one hunter or party less than five those blinds with less than five others may have hunters assigned to them. Once Missouri’s middle zone and the bulk of the upland bird seasons open blinds are rarely all booked. The second condition when blinds will be shared occurs during period of intense, short duration migration. Every couple of years the peak of the migration is a sharp rather than a broadly timed peak making for a rush to duck hunt. During such times when all blinds have at least one hunter in them the remaining blind less than their maximum five hunter capacity will be booked with other members. Overall during the majority of the waterfowl season there are empty blinds any day on any wetlands. A common concern with first year Association hunter is that they will be closed out from the best wetlands or blinds by other senior members. That issue is prevented by our reservation system that limits all to a maximum of two open reservations on the books at anyone time for duck blinds. Once two duck blind days are reserved one day must be consumed before another reservation is made. This system leaves open blinds and wetlands for others to fill. This combined with the earliest any Association hunter may make a reservation is 30 days ahead of the day of his duck hunt, not the season. The advantage our older unguided Association hunters do have is they have a better knowledge of the wetlands layout. Countering this is new members will be encouraged to preseason scout to equalize this imbalance. This is one price that the self guided duck hunter must pay for by himself, that is getting out on the wetlands in daylight scouting out blind locations. Our hunt reservations system maybe modified during the occasional drought year that exceeds even the capability of our pumps and reservoir lakes. During these years when some duck blinds may go dry the reservation system is further limited to a maximum of two duck blind days at a time as before but each day must be on a different wetlands. The entire goal is to insure every Association duck hunter has equal access to their preferred wetlands. All hunters receive the same map issue and operate within the same reservation system. All hunters have equal opportunity for their first choice of duck blinds and wetlands. Add to this we will never allocate more waterfowl hunting primary memberships than we have space for. 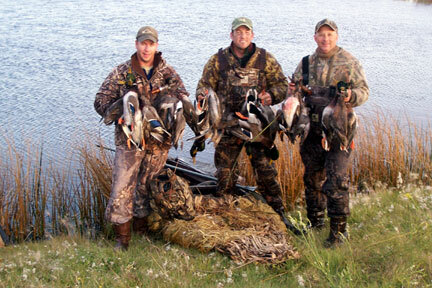 The point is that all may duck hunt on their schedule throughout the entire waterfowl season means that no one is ever denied a chance to go hunting. The confidence the duck hunter has in his ability to go duck hunting on his schedule is that we realize what it takes to have a good hunt. 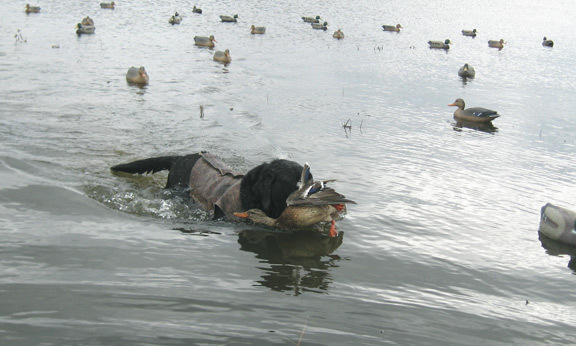 That good duck hunt brings hunters back to renew their membership in the Association. 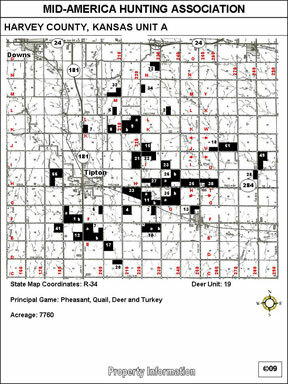 Page one of our private land map sheet is a road map showing how to get to the duck hunting lease may it be on a wetlands, pond or field. Page two of the waterfowl map will have the wetlands diagramed showing parking area, numbered blinds, holes, wade-in or layout boat area. 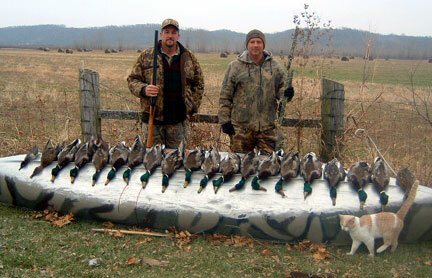 Review our Missouri private land waterfowl areas. Another band on the held greenhead. Before anyone starts counting birds compared to hunters in the picture be aware this group counts eight adult members plus a variable number of children. A pond duck hunt. While have a good number of managed wetlands with permanent blinds we have more ponds and watershed lakes in Missouri and Kansas on a variety of different fields to include this one that yielded regular season duck. A grand day well worth a picture. However, we never want to oversell just how hard our self guided duck hunts actually are. we all want such days with ducks like these, but these hunting days are more rare than any one would want.